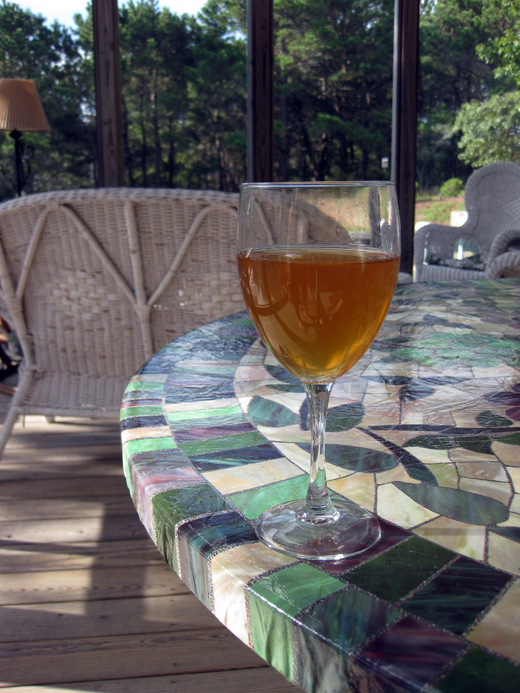 My friend Mat helped me make my first (and so far only) batch of mead in the spring of 2006. 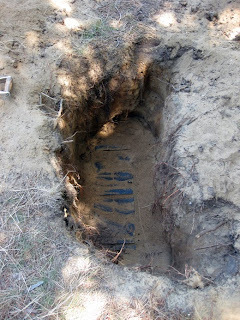 Two years ago we buried 8 bottles of the batch in an old wooden crate in the backyard of my parents' house on Cape Cod. Our plan was to dig the it up and drink a bottle each year. 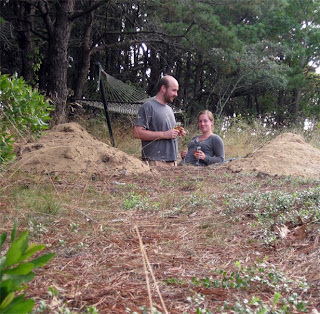 I didn't make it to the Cape last year until a cold October weekend, so this summer while Audrey and I were down there I made digging up the box for the first time a priority. Sadly Mat is currently spending ~18 months working in Liberia so he wasn't around, but hopefully he'll be available for digging and sampling next time. I remembered approximately where we buried the box, but after two years the scrub grass had grown over and I couldn't tell exactly where the mead pit was (for some reason we assumed we didn't need to mark the spot...). After pressing a shovel into the ground in a couple of places I picked an especially soft spot to dig. I came up empty with the first hole, but the second one was a direct hit. Audrey and I spent the next 30 minutes taking shifts with the shovel until the entire top of the box was visible. It felt like playing Battleship, first trying to hit the box, then figuring out the orientation. I tied a rope to the bolt we had attached to the lid, and pulled it open. I was half expecting to see earthworms, water, and rotten wood underneath the lid, but other than a bit of sand it looked exactly like it did two years ago. 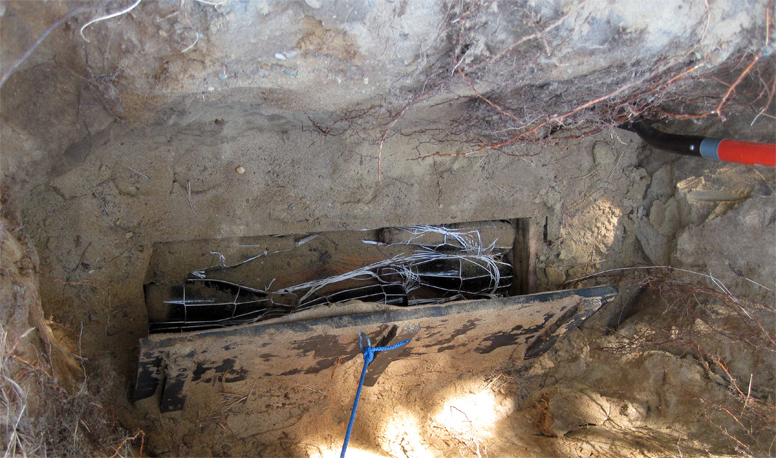 There didn't seem to be any roots growing more than a foot below the surface, so the box has been safe from them. I wasn't expecting too much from the mead because I had drank an unimpressive sample with a few friends (from the only bottle that avoided the crypt) last winter. Before opening the bottle we gave the bottle a couple hours upright for the flakes of protein (?) to settle out. Luckily the exertion of the dig paid off and the mead was better than I'd hoped with lots of complex flavors/aromas and a good overall balance. I don't think I have bottles of any of my beers older than this mead (although there are probably still a few floating around with previous brewing partners), so I'm looking forward to seeing how many more years it is worth drinking. Well made mead can supposedly last for decades when properly stored, I'll be ecstatic if this can make it a decade to 2016. 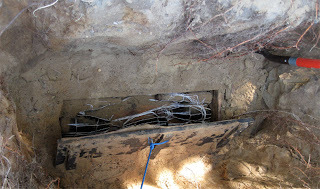 When we re-buried the box I left the rope attached from the bolt and sticking out of the ground to make it easier to find next time. We also stacked some rocks on the surface to give us a crude outline of the box. After burying the box I was struck with the idea that I should have put a bottle of beer in the box to drink next year. 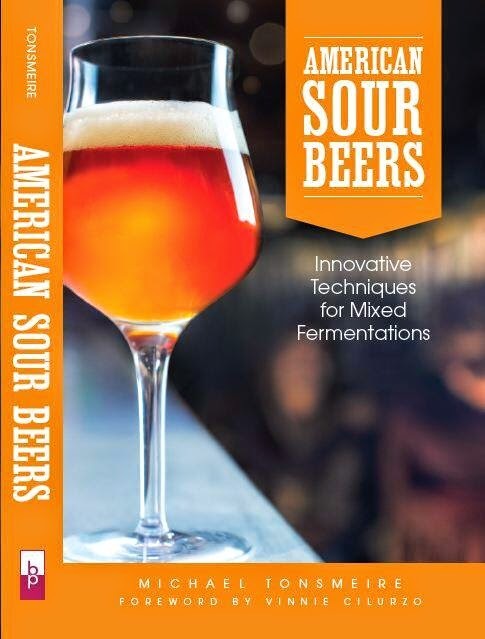 It might be a fun way to add another dimension to the project (maybe see how bottles of the same beer age in the ground compared to my basement). Appearance – Minor rust on the outside of the cap, with the wax intact I wasn't expecting that. Slight hiss upon opening, so the seal is still fine. The golden elixir pours crystal clear (after I gave it a few hours to settle before drinking). Smell – Complex aroma of oranges, flowers, alcohol, and some mild mustiness (first signs of oxidation). Seems like it is where a mead should be after four years. Taste – Moderate sweetness with a nice balancing tartness from the oranges. I think it ended with a better balance than many of the commercial meads which tend to pour on the sugary sweetness and fresh fruit character without balancing it with anything besides alcohol. There is an slight apparent booziness, but this is a lower alcohol mead (~12.5% ABV) compared to some of the alcohol bombs out there (I'm looking at you Poland). Mouthfeel – Fuller than the 1.005 finishing gravity might indicate, but still much thinner than a big beer would be. I don't miss the carbonation, which I think would detract from what body there is. Drinkability & Notes – A tasty mead, but I wish there were more people around to help with a 750. It hurt to pour half the bottle down the drain the next morning. Luckily they don't have a lawn to mow, most of the yard is covered by short shrubs (cranberry relative), and so the markers should be safe. Do you have a closer photo of your packaging? Was that a Champagne bottle corked and capped then coated with wax? The rust and wax is throwing me off. 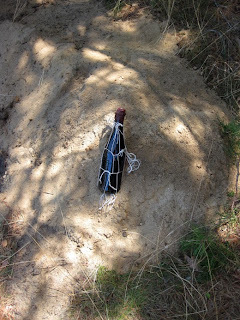 The original post has a close-up shot of one of the bottles. The bottles were not corked, just capped and dipped in waxed. Could you have avoided oxidation? Did you flush the bottles with c02? If I had the option, I certainly would have done that. There is no way to stop oxidation completely, but the more you can do to limit oxygen exposure, the better. Did you ever dig up a second bottle? I dug up another a few years after this, tasted like it had been underground in a wet box for a few years. I'm sure I'll give it another try eventually!